Note: Click the flyer above for a high-res PDF. Park Your Bike for Pennies! BikeLink elockers are now available for safe, low-cost bicycle parking for for commuters, transit riders or just those visiting the local area. 12 lockers are located conveniently at Vine Transit's Soscol Gateway Transit Center, just across the 3rd Street Bridge in Downtown Napa. For just 5 cents per hour for a maximum of 7 days, it's never been more affordable to secure your bicycle. 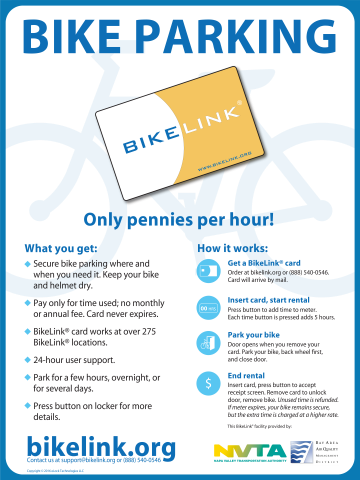 Sign up for an access card from BikeLink to use lockers in Napa County and other transit hubs throughout the Bay Area. Any questions? Email NVTA Active Transportation Coordinator Diana Meehan for more information.